GEM Cable is proud to present Lite Linke MTP® connectivity containment and cabling solutions, bringing together the best in class components, a highly skilled and motivated workforce, and the best turnaround times in the industry. Been here before and know what you’re looking for? Skip to the following product sections using the links below to navigate to your chosen MTP® Lite Linke product. Why Choose GEM Cable Lite Linke as your Fibre Optic Partner? 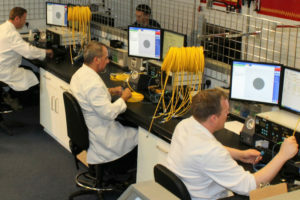 In the fibre optic business for more than 20 years, GEM Cable Lite Linke manufactures and supplies MTP® connectivity, containment and cabling solutions from its state-of-the-art facility. Our mission is to be recognised as the leading provider of MTP® solutions in Europe and we believe that the principles that characterise our business make that mission achievable. We supply the best quality solution at a price that offers superb value for money. We use only US CONEC’s highest grade (Elite) components and our technicians and engineers learn best practice directly from them. We also work with state-of-the-art equipment recommended by US CONEC including Daisi-MT interferometers, Domaille polishing machines and Optek System’s laser cleaver. 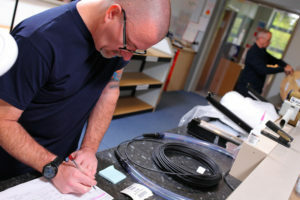 Our products are customised: whatever length, grade or colour of cable a customer needs and whatever connector option is required, we will supply the material to those exact specifications. In addition, we can fulfil an order in superfast time – indeed at light speed! We pride ourselves on short lead times meaning that our customers will receive their order within days, rather than weeks. We bring together the skills of designers and engineers in addressing industry challenges and are constantly innovating and looking at new materials and ways of working to offer the best solutions for our customers. We are approachable, reliable people who enjoy our work and take pride in delivering consistently high standards for our customers. GEM Cable MTP® Lite Linke products are categorized under three main sections; Cassettes & Chassis, Assemblies, Accessories. Please expand the items below each section for more information, including our links for each item on our Product Depot and their spec sheet. 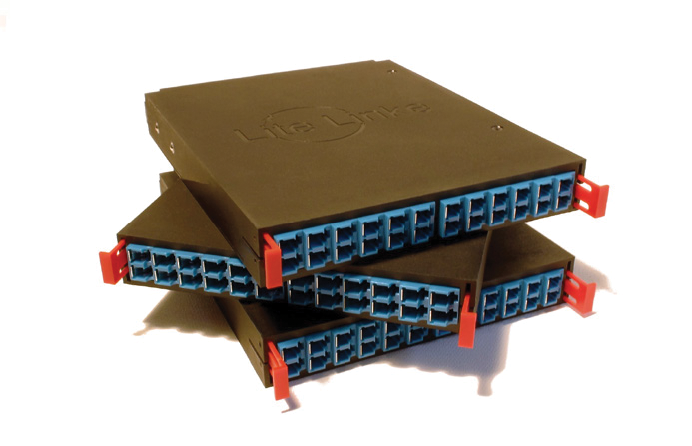 The Lite Linke MTP® chassis patch panel options are either in a 1U or 3U format, and are both housings for the premium grade, Lite Linke 24f MTP® ½U cassettes, delivering high density fibre distribution. Both options provide a highly efficient fibre optic connectivity solution using MTP® to LC presentation. 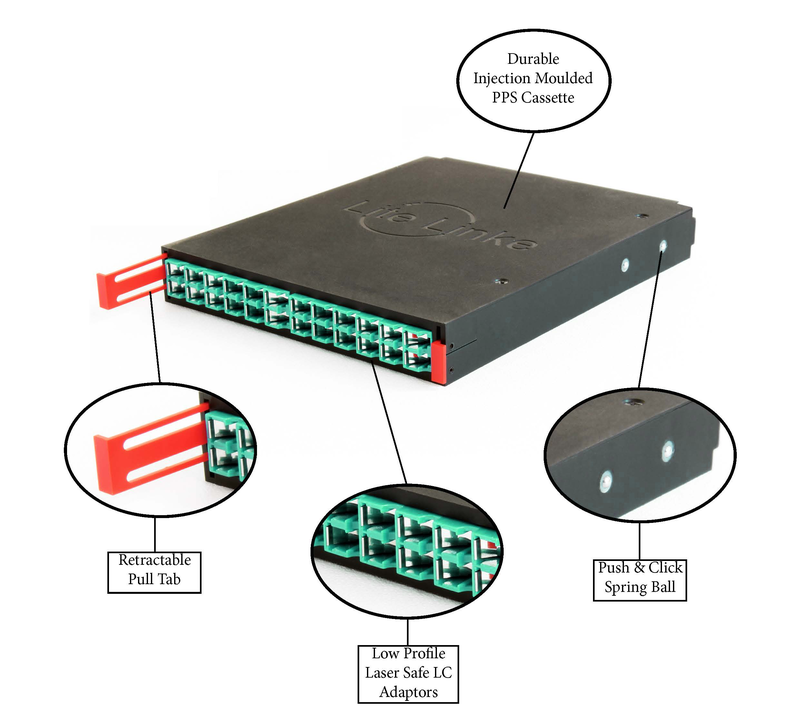 The tool-less and pluggable network eliminates the need for expensive on-site splicing and greatly reduces installation time. *MTP® is a registered trademark of US CONEC Ltd.
Our 1U PPS injection moulded 6 slot chassis provides housing for up to 6 ½U 24f cassettes. 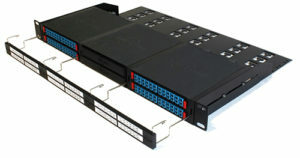 A fully loaded 1U chassis will contain 144f in LC HD adapter format to the front and twelve MTP® adapters to the rear. The solution is best served by the use of LC HD Uni-boot switchable patch cords which are neatly managed by the four cable ring attached to the chassis front. Attachable cable management is also provided for the rear of the chassis. The Lite Linke MTP® chassis options are in a 1U or 3U format and are both housing for the premium grade, Lite Linke 24f MTP® cassettes. Both options provide a highly efficient fibre optic connectivity solution using MTP® to LC presentation. 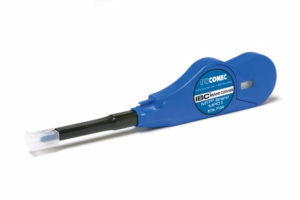 The tool-less and pluggable network eliminates the need for expensive on-site splicing and reduces installation time. *MTP® is a registered trademark of US CONEC Ltd. The Hyper HD 3U PPS injection moulded chassis provides housing for up to twenty ½U 24f cassettes, which fully loaded contains up to 480f in LC adapter format to the front. 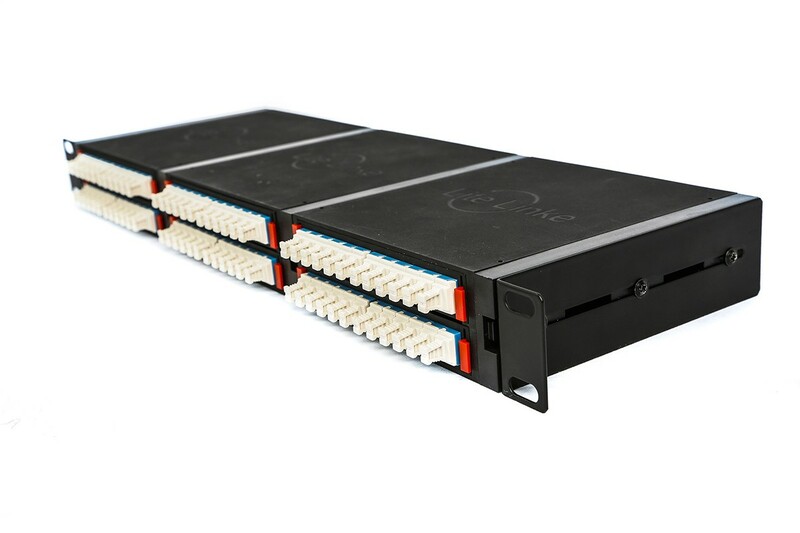 It is possibly the highest fibre count, modular solution on the market within a 3U space and benefits of only requiring one cassette to start thus providing an excellent solution for expanding networks. 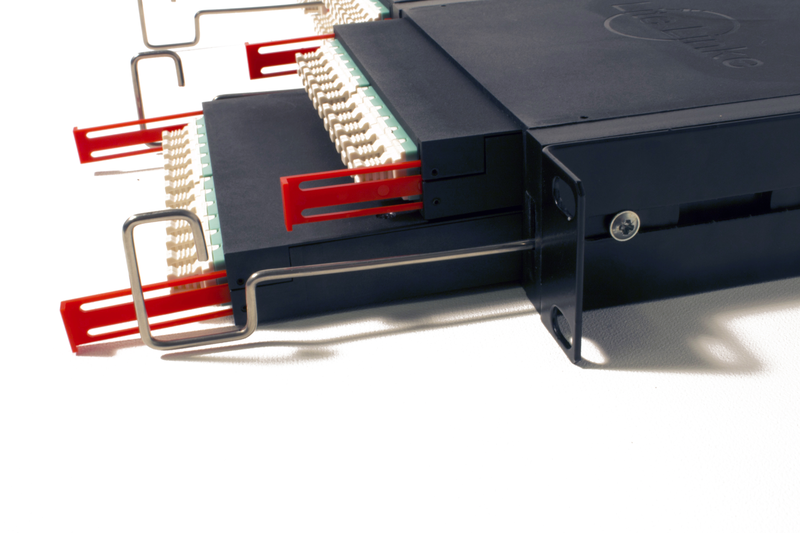 The 3U solution accommodates up to forty separate 12f MTP® cable links to connect into the rear of the chassis. The Lite Linke MTP®* Solution is a premium grade, hyper high density 19” cassette and chassis system. It operates on similar lines to conventional networks, insomuch as a trunk cable, patch panels at each end and jumper cables patching to the operating hardware. 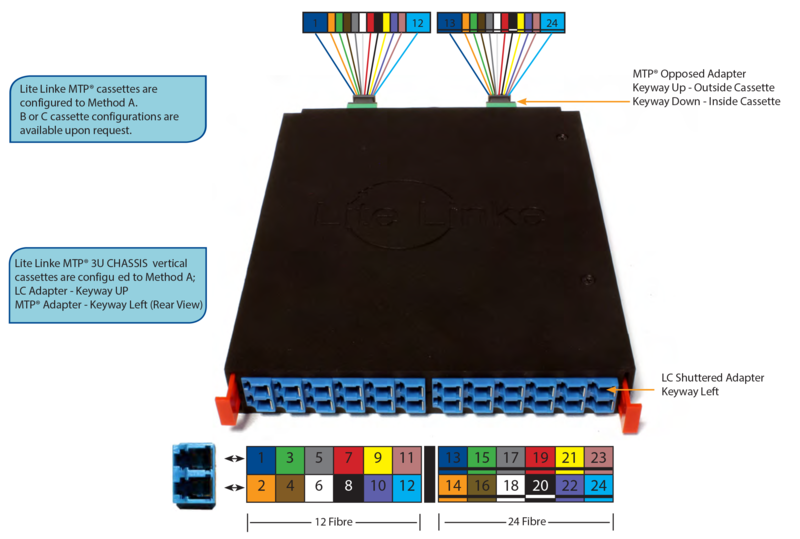 Lite Linke MTP® solutions provide a more efficient, condensed method – a tool-less and pluggable *high density population fibre optic network, without the need for expensive on-site splicing and thus reducing installation time. *As the solution is designed for High Density applications, Lite Linke LC HD assemblies must be used in conjunction with the cassette. Centred around its sleek injection moulded 24f cassette, the Lite Linke MTP® Solution presents up to 144f in a 1U and up to 480f in a 3U space. 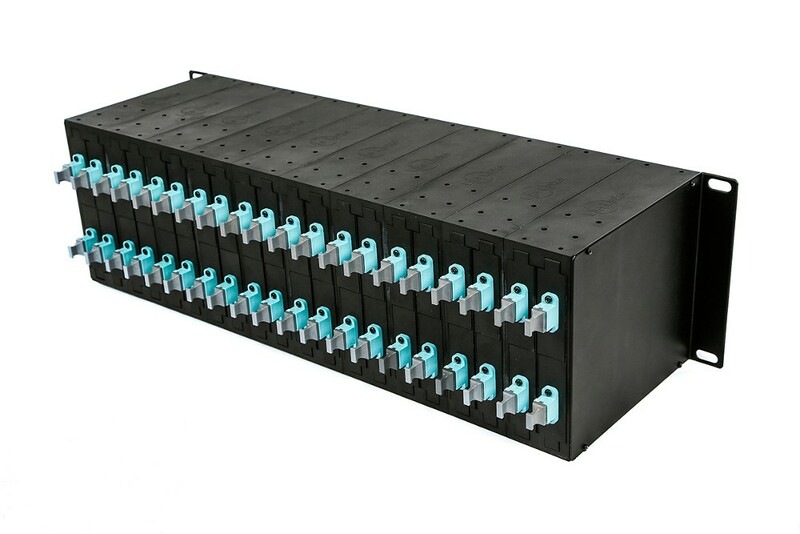 The modular design offers the versatility to present a single 12f link trunk up to 12x 12f links on a 1U and up to a maximum of 40x 12f link trunks on a 3U system. It allows for a buy and build approach as the network grows without demanding more valuable U space within a cabinet. The ½U cassette is of a tough durable PPS construction and fitted with 12x low profile laser safe LC Duplex adapters to the front and 2x MTP® adapters to the rear. The low loss LC Duplex adapters are colour coded for ease of fibre type recognition; aqua for OM4 and blue for single-mode. The sealed cassette contains premium grade fan-outs; either 2x 12f or 1x 24f LC to MTP® elite on OM4 or single-mode fibre, according to choice.To the front of each cassette are two sliding pull tabs which are used to aid removal from the chassis. The pull tabs recess into the cassette for tidy storage. Each cassette is fitted with 4x spring-ball bearings which locate inside the chassis with an audible click on correct fitting. MTP® Lite Trunk Cable Assemblies are of a lightweight single jacket construction, designed to optimise space saving of trunk patching. The 12f cable has a 3.2mm outer diameter while the 24f version being marginally larger at 3.6mm. These compact cables are packed with Kevlar® which provides the necessary endurance for routing and patching purposes, though best used within a Comms Room or Data Suite environment. 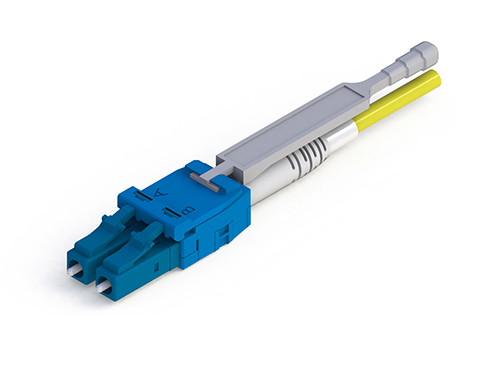 Only genuine MTP® connectors are fitted to our cables and are available in two formats; Standard grade and Elite MT ferrule for those applications requiring the highest performance. Both provide exceptional benefits over the conventional MPO connectors, including patented floating ferrule design, patented elliptical, high precision guide pins and removable housing allowing rapid gender change and reversing polarity (tool required). Lite Trunk assemblies are manufactured in our state-of-the-art facility utilising equipment recommended by and personnel trained by US Conec. 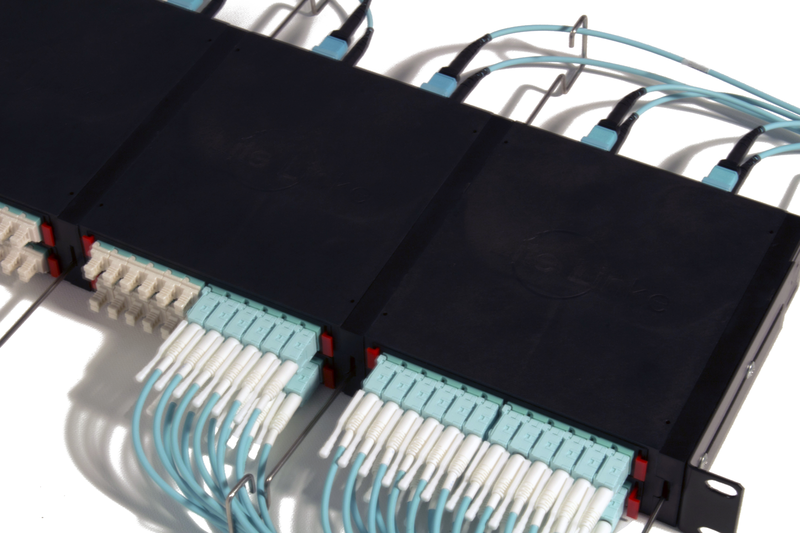 The MTP® Lite Trunk assemblies facilitate rapid deployment of high density backbone cabling in data centres and other high fibre count environments, reducing network installation or reconfiguration time and cost. They are used to interconnect cassettes, panels or Ruggedised MTP® Harness Links. MTP® Tuff Trunk Cable Assemblies are of a Robust Double Jacket construction, designed for longer length trunk patching. Incredibly, the provision of a second jacket benefits the cable by an additional 500N of crush resistance to an overall total of 1000N. The cables retain their compactness with only 4.7mm O.D for 12f and 5.4mm for the 24f version. These cables are packed with Kevlar® which provides the necessary endurance for routing and patching purposes, providing links between Comms Rooms or Data Centres. Only genuine MTP® connectors are fitted to our cables and are available in two formats; Standard grade and Elite MT ferrule for those applications requiring the highest performance. Both provide exceptional benefits over the conventional MPO connectors, including patented floating ferrule design, patented elliptical, high precision guide pins and removable housing allowing rapid gender change and reversing polarity. Tuff Trunk assemblies are manufactured in our state-of-the-art facility utilising equipment recommended by and personnel trained by US Conec. 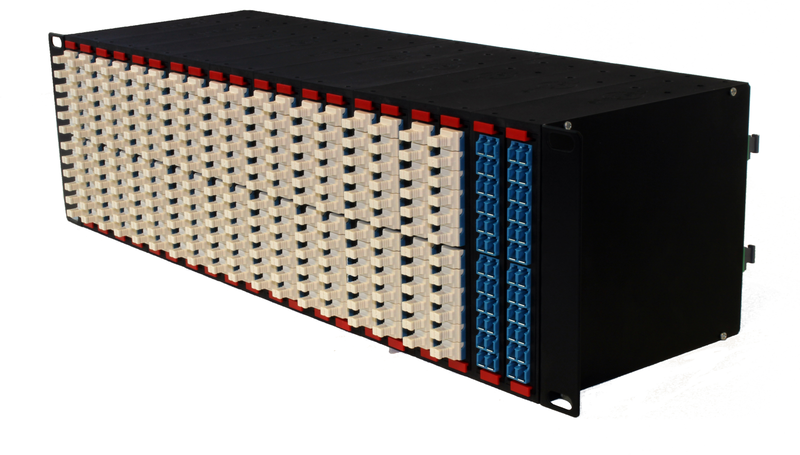 The MTP® Tuff Trunk assemblies facilitate rapid deployment of high density backbone cabling in data centres and other high fibre count environments, reducing network installation or reconfiguration time and cost. They are used to interconnect cassettes, panels or ruggedised MTP® Harness links. MTP® Multi-Lite Trunk assemblies are a neat solution for providing up to four MTP®-MTP® links within a compact, high density ruggedised cable. 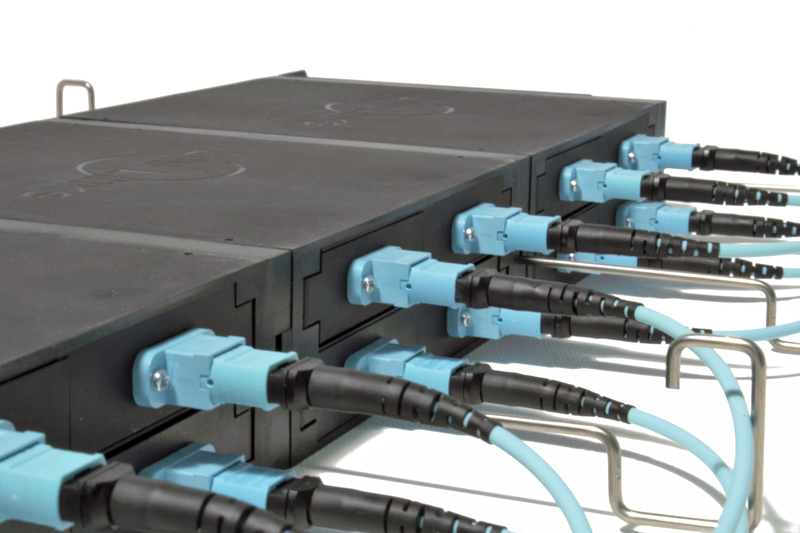 The cable construction consists of four ruggedized 12f tubes over-sheathed with a LSZH jacket. Two layers of Kevlar® form the reinforcement and provide ample mechanical resistance beyond expected installation handling. The benefit becomes the ease of installation with managing one cable rather than four cables. Also, with an outer diameter of 9mm, installing an MTP® Multi-Tuff trunk saves space with cable routing. 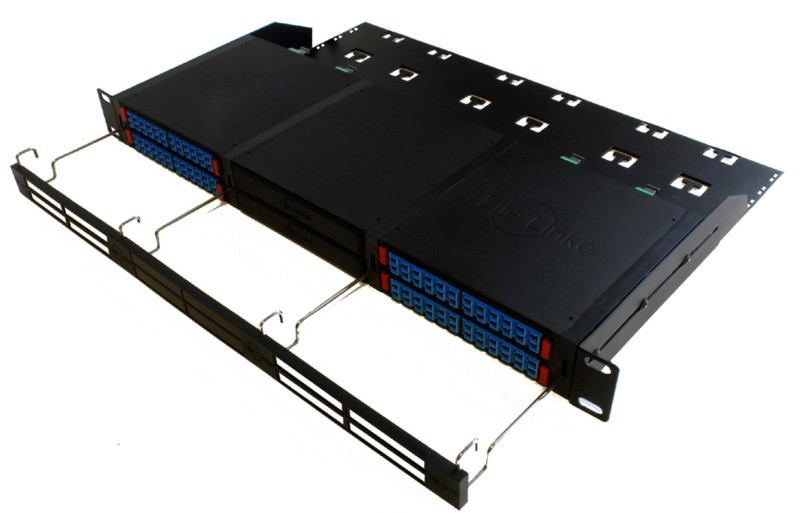 The Multi-Lite Trunks can be configured not only as permanent links but also for QSFP cable links for SR4 and CXP parallel optics applications. As these style of assemblies cater for up to 48f, the MTP® connectors can be split into: 4x 12f MTP® to 4x 12f MTP®, 2x 24f MTP® to 2x 24f MTP®, 2x 24f MTP® to 4x 12f MTP®, 2x 24f MTP® to 3x 16f MTP®. Hybrid assemblies from multi-MTP® connectors at one end to LC connectors at the opposite end are also available, for example 2x 24f MTP® to 48 LC Connectors. Manufactured within our state-of the-art termination facility where meticulous attention provides assured quality and peace of mind. From our North Wales base, fast-manufacturing turnaround is our speciality with custom length assemblies made within days of ordering. MTP® Multi-Tuff Trunk assemblies offer exceptional fibre counts from 48f up to 144f, all contained within one robust trunk link assembly. Typical configurations of up to 12x 12f MTP® to 12x 12f MTP® or 6x 24f MTP® to 6x 24f MTP® assemblies can be provided. The Multi-Tuff trunk provides exceptional durability when compared to traditional MTP® trunk cable, with a crush resistance of 2000N and tensile strength in excess of 1500N. The colour coded tails can either be left flush or staggered to fit a protection sock for prudent installation practices. The sock then fits to the break-out manifold ensuring the tensile loading is not on the fibres during or post installation. The cable construction consists of up to 12x 12f tubes managed around a central strength member. The cable is packed with aramid yarn for added protection and an outer black LSZH universal jacket. The manifold is fitted with a anti kink strain relief boot and with its threaded front, fits into a 20mm capillary much like a cable gland making these assemblies equally suitable for indoor and outdoor applications. Manufactured within our state-of the-art termination facility where meticulous attention to detail provides assured quality and peace of mind. From our North Wales base, fast-manufacturing turnaround is our speciality with custom length assemblies made within days of ordering. Ruggedised Harnesses or Fan-outs, as they’re sometimes known, allow the direct connection between MTP® adapters and other connector types. 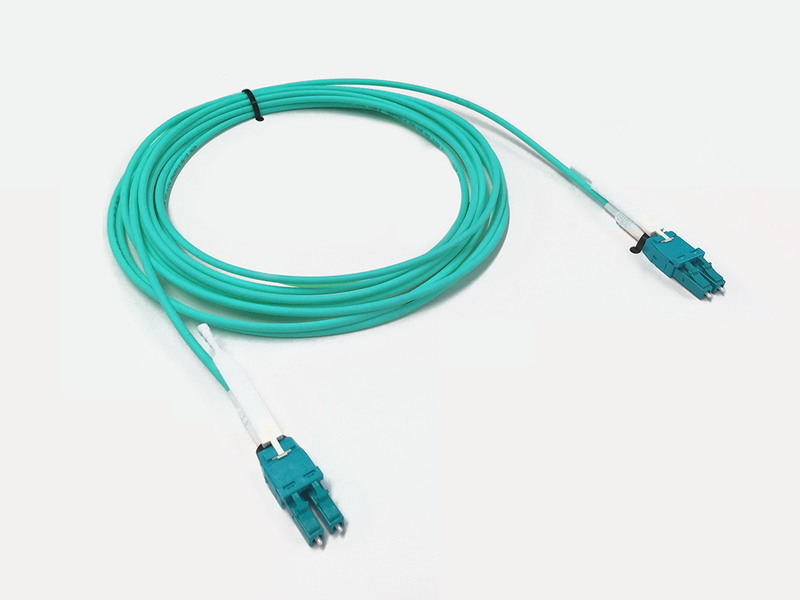 Typical use for these assemblies is for QSFP 40G SR4 connectivity where the break-out units split into 8x fibres or 4x 10G channels and are interoperable between differing QFSP manufacturers. Other configurations are MTP® 12/24f into 12/24 sub-unit tails. The harnesses can even be made with up to 24x LC connectors at both ends of the assembly. They enable direct patching from the MTP® port on the switch to MTP® Cassettes and are readily available to custom length at short notice. LC simplex and duplex are the most popular though mini-LC (mSFP) with its 5.25 pitch, plus other conventional connector types such as SC, ST or FC/PC are also available. There are also a choice of strain relief boots; flexi-boot, short or standard options. The Flexi-boot not only provides the smallest bend radius it also reduces the need for cable management as the boot is simply positioned into the desired direction and is retained. The LC HD Uni-Boot is our most compact solution which provides two fibres into a single tube with the added benefit of a switchable LC pull tab enabling removal of the connector without disturbing neighbouring ports. 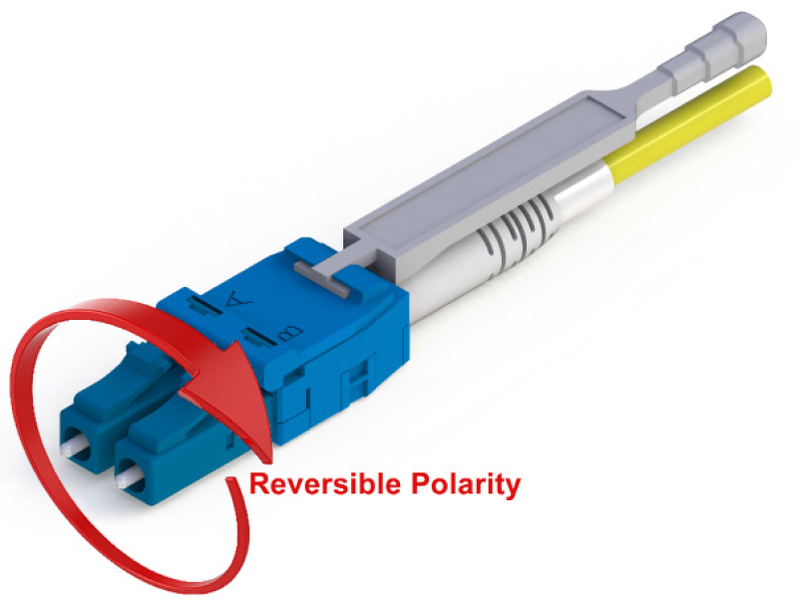 The switchable function allows for changing of polarity of the LC connector post manufacture. 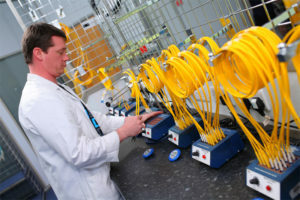 MTP® harnesses are manufactured in the UK using the highest quality components. 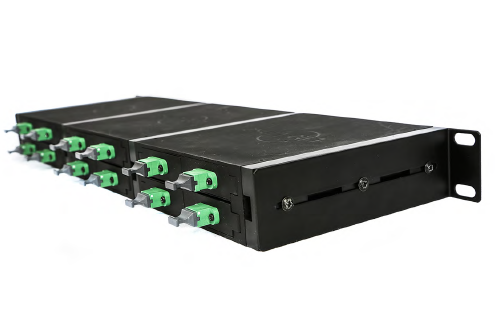 Utilising the feature packed LC HD Switchable Uni-boot connector on your assemblies offers the most efficient use of rack space. Combining two fibres into a single round 3mm jacket can save up to half the patching cable space while the disconnection latch makes for easy removal of the assembly without disturbing the neighbouring ports. The connector has been further enhanced with the ability to switch polarity in the field without the need for re-termination making the connector extremely flexible. 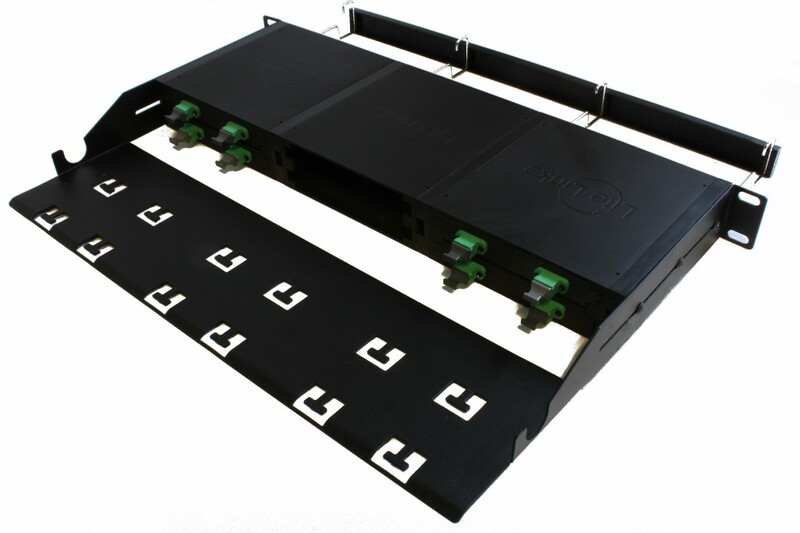 It is also available in a variety of boot options including short and flexi-boot to suit your preference in cable management. 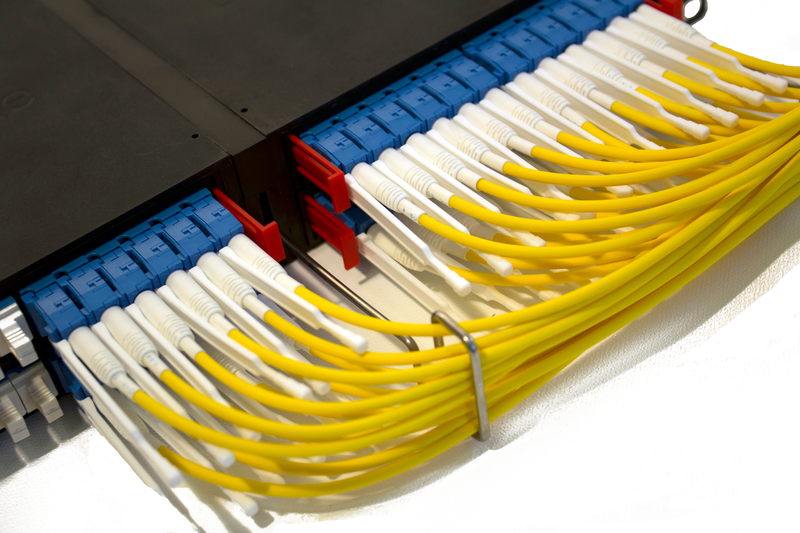 Colour coded cables and connector options are available to suit OM3, OM4, OM4+ and SM G.652.D and G.657.A2 fibres. The assemblies are manufactured within our state-of the-art termination facility where meticulous attention provides assured quality and peace of mind. From our North Wales base, fast-manufacturing turnaround is our speciality with custom length assemblies made within days of ordering. We use only US CONEC’s highest grade (Elite) components and our technicians and engineers are trained by them. We also have state-of-the-art equipment recommended by US CONEC. 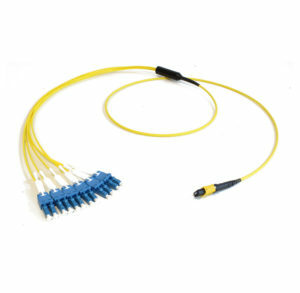 US Conec manufactures durable MTP® brand connectors that provide quick connection for up to 72 optical fibers. Connection integrity is provided by adapter latches which are locked into place on the connector plug by a spring loaded sliding mechanism. US Conec’s MTP brand connector components are fully compliant with IEC Standard 61754-7 and TIA 604-5 – Type MPO.